I: Thou shalt first maximize all other tax-advantaged opportunities before even thinking about whole life insurance! The appeal of whole life insurance is that the gains are tax-exempt (but note the caveats, see Commandment IX below). The big disadvantage, of course, is that a good chunk of the tax advantage is offset and simply arbitraged away through high fees and thus lands in the hands of insurance companies and insurance salesmen. I would argue that the only way anyone can make a case in favor of WLI is that its returns compare favorably with those in taxable accounts. Thus, if you haven’t already maxed out all other routes of tax arbitrage (401k, Health Savings Accounts, IRAs, Roth IRAs, 403b, 457 plans, etc.) Whole Life Insurance should not even be on your radar screen! II: Thou shalt not forget that longevity risk is the real problem in retirement planning! Life insurance hedges the risk of your early demise. It’s great for young families that want to cushion the risk of a spouse (or both) dying young and leaving the survivors without an income. In contrast, running out of funds in retirement is normally a result of living too long combined with Sequence Risk and a withdrawal rate that was set too high. This alone tells me that WLI can never play a major role in retirement planning, certainly not early retirement planning. The bulk of our assets belong in productive high-return assets that ensure we don’t run out of money should we live into our 90s and beyond. How many of you seven-figure-net-worth readers out there have collision coverage on your $20,000 cars? If you indeed keep collision coverage and thus you don’t self-insure against this pretty trivial loss then you should ask yourself: Isn’t your spouse worth more than your mildly used Toyota Camry? Here in the ERN household we currently don’t have a car but once we have one again it would be a new or mildly used car in that price range and we will probably keep collision coverage at least for a few years. As we had with our previous car(s). Despite being multi-millionaires! Yes, we could self-insure but we won’t. Being in a car wreck is traumatic enough and potentially correlated with some other nasty crap – hospital stay, medical bills, etc.! So, we don’t want the additional expenses on top of that. In the same vein, having (permanent) life insurance is rationalizable even for folks who could theoretically “self-insure” because losing a spouse prematurely is a tragic and traumatic event that may also be correlated with large expenditure shocks, especially medical bills! Moreover, while some expenses of the surviving spouse may be lower (one spouse eats less than two spouses) others probably stay the same (most surviving spouses stay in the same house instead of moving to a house half the size/cost) and other expenses may even rise. That’s because the surviving spouse, especially in old age, is more likely to have to hire external help. And the surviving spouse will lose the married tax filing status. So, again, don’t go overboard with the coverage. But a small policy with a death benefit in the low six-figures to hedge against some of the uncertainties of an early death of a spouse doesn’t look so bad! So, in other words, much of the WLI opposition is simply due to a classic logical fallacy: The False Dilemma Fallacy. If my only two choices were 1) no WLI at all and 2) my entire retirement savings in WLI, then, absolutely, I would pick option 1, too. But that’s not how the world works! III: Thou shalt consider policies with the shortest possible premium period! Normally, you’ll have to pay whole life insurance premiums for as long as you live. Both my wife and I have policies that have front-loaded payments for only a specified number of years, e.g., twelve years in the case of my wife. In contrast to term life policies, though, where the coverage ends when you stop making payments, our policies are still whole life policies with coverage until we pass away. Needless to say, the accelerated payments are higher. The advantage of accelerated payments, though, especially for early retirees, is that the payments fall mostly into our working years while we still had high incomes. So, we limit the outlays while in retirement and thus reduce Sequence Risk. In fact, ideally, I would have preferred to make just one single payment upfront (pre-retirement) and be done with it. But there are limitations from the IRS about how to structure a whole life insurance policy (see Commandment IX – Tax Issues). IV: Thou shalt not over-extend yourself! If you ever consider buying whole life insurance make sure you minimize the risk of future cash flow problems, i.e., not being able to afford your premium payments. Having to surrender the policy will ensure you’ll have a low, often negative rate of return! So, my guideline is very simple. I made sure I could afford the total (!) cumulative premium payments (annual premium times the number of years) in one large lump-sum payment at the time I start the policy. I would never spend money on WLI that I don’t already have. And with “afford” I mean not having to sell all my assets but rather being able to pay that total cumulative premium easily out of a year’s worth of cash flow. Just to give you an example: My wife’s policy costs a bit over $3,000 a year. The total over twelve years is just under $36,200, which is significantly less than the six-figure sums we would routinely save while I was still working. Of course, you’ll very quickly realize that your insurance salesman might try to size you up and see how much you can afford to save every year and try to grab as much of that as possible. That’s how high earners like medical doctors end up with WLI policies costing $50k and more per year. That’s clearly way too much coverage and it obviously violates several of the Commandments listed here. =RATE(# of years of remaining life expectancy, (-1)-times Premium, (-1)-times CurrentCashValue, DeathBenefit, 1). But that’s incorrect! The proper IRR calculation has to take into account the expected cash flows, i.e., flows weighted by the death probabilities each year. It’s the actuarially correct way and I did some calculations like that in a case study on WLI a few months ago. It turns out, keeping the policy in place had a very respectable IRR going forward! Not taking into account the death probabilities along the way will likely underestimate the true IRR. In other words, with a truly bad enough policy, i.e., one that has an awful looking IRR even looking forward (considering the low initial returns a sunk costs) one would, of course, be better off to pull the plug. In response to the WLI case study a few months ago I got a few comments and emails from folks with WLI policies that didn’t seem like worth keeping! Don’t throw good money after bad! In fact, the last thing you want to do is to cash out after reaching a capital gain. That’s because you’ll lose the tax-advantage of WLI and you’ll have to pay taxes on those measly gains. Cut your losses as early as possible! VII: Thou shalt not compare WLI with equity returns! Often people point out that the expected (and realized) whole life insurance returns will likely fall short of what you’d expect from equities. I completely agree. But so what? By that same logic we should never invest in bonds and simply hold 100% stocks! In fact, most folks in the FIRE crowd have at least a small percentage of bonds in their portfolio for diversification purposes. So, if WLI has an expected return lower than stocks but still higher than bonds then we should at least consider replacing a portion of the bond portfolio with WLI. That was my rationale to sign up for WLI. I had compared expected returns for the WLI contract, slightly above 5.5%, with bond yields that were around or even below 2% at that time. Side note: The 5.5% figure is the IRR using the non-guaranteed death benefit, but so far both the cash value and death benefit have increased ahead (!) of the estimated non-guaranteed schedule indicated in the policy documents. We are now probably looking at an expected IRR North of 6%! So, as someone who holds very little money in bonds, I rationalized our WLI engagement as a pretty good bond alternative! Never an equity alternative!!! VIII: Thou shalt only work with a highly-rated mutual insurance company! Some bloggers have made the claim that because WLI companies invest their insurance reserves in a bond portfolio, a WLI policy can’t perform better than that bond portfolio. That’s not true! First, insurance companies, especially those with high credit ratings will likely hold reserves way in excess of what’s necessary to satisfy all future payouts. Second, because so many unsophisticated WLI clients surrender their policies ahead of time (i.e., they likely don’t heed Commandment II above) returns for those who don’t surrender their policies can be higher. In other words, someone else’s misfortune (=a low IRR from cashing out the policy early) will likely result in higher IRRs for those smart (or lucky?) policyholders that don’t let their policy lapse. Isn’t that ironic? In a way, I should just keep my mouth shut and let the WLI bashers keep at it to entice more folks to surrender their policies. It would raise my own IRR through higher dividends. And talking about dividends, I also like the concept of the mutual insurance company where policyholders (at least those in WLI policies) are shareholders. The math is simple: dividends are likely higher if profits don’t have to be shared with equity owners of a publicly traded corporation. The tax benefits of WLI come with (at least) two asterisks. Todd Tresidder at Financial Mentor has a great article about the pitfalls of WLI and I liked the section about the potential tax headaches a lot. First, gains are certifiably tax-free if you keep the policy until the end (i.e., your end). Loans against the policy are OK as well but only as long as they don’t completely exhaust the cash value. But if you were to surrender the policy before you die then any gains would be taxable. Another way WLI could lose its tax advantage is if it were to become a “Modified Endowment Contract.” Any effort to “front-load” the insurance premium payments too much could void the tax-free status. A good insurance agent should be on top of this constraint and make sure this never becomes an issue. Check out this interesting CNBC article on the tax issues of WLI. Talking about taxes, there is one frequently ignored benefit of WLI. It has to do with the fact that many view it as a fixed income substitute. Of course, most people hold bonds in their tax-advantaged accounts for tax efficiency. Thus, moving a portion of one’s bond portfolio into WLI frees up space in our tax-advantaged accounts to shield more of the equity portfolio from the drag of taxable dividend income. From personal experience, this dividend drag was particularly onerous during my high-income years. How much of a difference does that make? With a dividend yield of roughly 2% for the typical U.S. equity index fund and a 28.1% combined marginal tax rate (15% federal for qualifying dividends, 3.8% Obamacare and 9.3% California) while still working, I got an additional 0.562% through better tax efficiency. Per year! Not that there was ever any doubt that the typical bond mutual fund (AAA corporate bonds to match the credit quality of my WLI company) would vastly underperform the tax-free return of our WLI policies. But with this added tax benefit, our WLI contracts really mop the floor with the average (investment-grade) bond mutual fund! Moving a portion of the bond portfolio into WLI has the pleasant side effect that we free up space for equities in tax-advantaged accounts! Another example: The “Accidental Death Rider!” If I’m dead I’m dead. I’m not any “deader” if I die in an accident. In fact, if that option existed, I would almost prefer the opposite rider, the “die after a long and painful terminal illness rider” because that at least would hedge some of the medical costs. Talking about terminal illness, one rider that’s normally provided free of charge or for a small fee is the “Accelerated death benefit rider.” One would have early access to all or at last a portion of the insurance benefits if one can prove to have an incurable medical condition that will result in certain death soon, e.g., terminal cancer, etc. It’s a nice option to have for folks without any other assets facing big medical bills but seems quite useless for us in the FIRE community with plenty of other liquid assets. Money is fungible! If it’s a free option go for it but I wouldn’t pay anything extra for this rider. Though not called a rider, another overpriced feature is the monthly payment option. Instead of forking over the entire annual premium at the beginning of every policy year you can stretch out the payments into semi-annual, quarterly or even monthly payments. But the monthly payment is more than one-twelfth of the annual premium! The IRR of that twelve-month payment plan can be 10% and more. I don’t think it’s worth it to pay that much “interest” for a monthly payment plan. So much for today! Do you have Whole Life Insurance? Did we miss any other issues to consider? Please weigh in below in the comments section! Posted on September 26, 2018 September 25, 2018 by earlyretirementnow.comPosted in Asset AllocationTagged bonds, equities, finance, investing, Life Insurance, personal finance. Next Next post: Did Suze Orman just pour cold water on the FIRE movement? So glad you put the deeply held “beliefs” to the test with math. One size does not fit all. Looking forward to meeting you at FinCon! Thanks! Hope to run into you at FinCon! * WLI is NOT like auto insurance and comparing your spouse to a $20K car seems inappropriate. More specifically, your vehicle can be in an accident many times, your SO can die only once. Similarly, you can easily find a substitute for a car, your SO, not so much. * The general intent of WLI at the individual level is to provide coverage in a time of financial need. NOT a future income stream. If you were to compare it as an investment purely on financial terms, it loses, every time. PARTICULARLY given an assumption of a 7-figure net worth household. * If the goal is to reduce taxes, there are plenty of other alternatives that don’t involve death. Anyway, great article, I particularly liked the last ‘commandment’! 1: I never thought that anyone will misunderstand me and conjecture that I’m comparing a car with a spouse. Again, to be clear, just BECAUSE your spouse is so much more irreplaceable than your car you should consider WLI. 2: I never claimed that WLI is a solution for cash flow. See what I wrote in commandment #2. 3: See Commandment 1: It’s for folks that have exhausted their obvious tax-advantaged accounts. After those options are exhausted you’re normally left with other expensive high-fee options, like WLI, variable annuities, etc. Interesting. In answer to your (rhetorical) question, no I don’t keep collision on any of my cars, but almost had to just to get an umbrella policy. Also the False Dilemma isn’t one I had considered at all. For me the dilemma was WLI vs Term+Invest the difference. And I factored in the fact that I could afford adequate term insurance when our kids were young and our financial needs would skyrocket if one of us died. WLI for our needs then was unaffordable. Now that they are grown and our net worth is large we are shedding our term policies happily and self insuring. 10,000 whole life salesmen just thanked you simultaneously, Karsten 😉 They’re going to point to this article as an endorsement for what is often a grossly inappropriate and overpriced product for many people (when in reality it’s a simple explanation of all the caveats you should consider BEFORE buying the policy). That said, you laid it out well. I can see the logic and rationale in your situation. I was wondering about considering it as part of your bond allocation (or a fixed-income-ish investment if you will). Is it the fact that the value isn’t correlated with stock market performance and tends to be much less volatile (assuming you don’t die anyway 🙂 )? How would you access the funds early without paying steep penalties (or do cancellation/withdrawal fees go away after a certain point)? Curious too about accessing. If someone was planning on accessing WLI funds in the future they would most likely have to repay with any interest accrued. Which would not be possible if you needed the funds. So you would accelerate the drawdown of your policy’s cash value due to accruing interest. Ultimately it could lead to a zero cash value and death benefit. Great question! That’s why I’d not like a whole sequence of loans against the policy that would eventually wipe out everything. I would either use it as a short-term cash reserve for a large temporary loan that’s repaid before too long. Remember, rapaying the loan plus interest will increase the cash value again. Or one could tap the cash value slowly enough to guarantee you’ll never deplete the policy completely. Thanks, Justin! I hope they send over traffic and let all clients go through the list. Probably 90% of folks interested in WLI might change their minds! Correct: WLI returns should be pretty much uncorrelated with our volatile equity portfolio. Accessing the WLI cash value before death would be a last resort for us with a 7-figure net worth. But it can be done with a loan against the policy rather than surrendering it. Thanks for this, and thanks for pointing me to your older WLI post which I had somehow missed. Slightly off topic, but your discussion of probability-weighted returns made me think of something I had been wondering about before back in your SWR series; have you ever considered using survival probability in calculating failure rate? I can see pros and cons in doing so, but I think ultimately it gives a better picture of the actual risk. I just don’t have the skills (yet) to create it! With regard to WLI it seems like the scenario where you are the beneficiary of someone else’s policy is different than how it is sometimes used (and sold): as a savings vehicle which is borrowed against to fund retirement. For that it seems awful – you have to use cash value (which is lower than death benefit), bond returns, and borrowing costs. In the SWR series, the probability of running out of money is conditional on actually living that long. For the 50+ year horizons, we probably have to divide the failure probabilities by 5 or 10. Wouldn’t make a difference though when calculating fail-safe probabilities. About the second question: If you don’t care at all about leaving a bequest then maybe WLI is not for you. I hope we will leave a bequest to our daughter more than our combined WLI death benefits. So, for us, the value is really the death benefit not the cash value. Our car is worth about $3000. The only reason that I buy insurance is in case we hit someone’s Ferrari or whatever. Here the registration fee includes compulsory insurance for injury to people but not to property. I don’t think you can debundle the insurance for damage to other people’s property and to your own car. I definitely would not insure a $3000 car. We do have life insurance and disability insurance that is bundled into our employer retirement plans. I think it is term life insurance. I still don’t understand what whole life insurance is. I would never question anyone’s LIABILITY coverage. Only the collision coverage that pays exclusively the damage to your own $3,000 car. I’m not sure I agree with you about the living benefits (terminal, critical illness, chronic illness, etc.) I’ve been thinking of those as an important hedge against the healthcare cost risks many early retirees face, particularly before Medicare age. These are especially beneficial to couples where one person who is ill could seek aggressive treatment or support without depleting the joint savings that the other will depend on. Full disclosure, I just joined a life insurance company. It’s been a real eye opener for me, since I wasn’t very familiar with life products before starting. Thanks for covering this (taboo!) topic. Thanks for weighing in. I’d still like the hedge against medical expense risk even post-age-65. That’s why I like whole life insurance that doesn’t expire like term. And good luck trying to get another 20-year term policy at age 55! I am admittedly of the school of thought that insurance is a tax on people who are bad at math, but I greatly respect Big ERN’s opinions (and know you are quite phenomenal at math), so I tried to set my preconceived notions aside. I take your point that if you have bonds and max out other tax advantaged vehicles this could (sort of) be a better deal. We aren’t much into bonds these days and to the extent we do buy bonds it would only be for our rising equity glide path. One advantage hinted at but not spelled out is that whole life insurance could be a way to get a sort of long term care insurance for (maybe) less cost. For example, Spouse 1 has early onset Alzheimer’s requiring 15 years of specialized care. The first 12 years of specialized care deplete the couples substantial assets leavings spouse 2 with only a paid off house and social security before Medicaid kicks in to cover the last 3 years of nursing home care. When spouse 1 eventually passes, spouse 2 receives the whole life insurance payout allowing for a return to a more reasonable lifestyle. This seems like it could be clever way to shield some marital assets, if the premiums are much lower than long term care insurance. I am still a bigger fan of maintaining separate finances and not getting married (but setting out the rights and privileges you want to partake in with your long term partner in some legal documents: wills, trusts, medical and financial powers of attorney, etc.) to hedge against the long term care risk. But I understand this is not an option for everyone. Thanks! For full disclosure, insurance is not a dirty word in economics and finance. You pay for the expected value plus a little bit extra and the insurance company and the insured should both be happy. But there are some contracts that are not worth it (extended warranties and many bad WLI contracts). Also excellent point about WLI as a quasi-long term care policy. Most folks spend only little time in LT Care and then pass away. WLI could then replenish the savings of the survivor! Very good point!!! I’m sorry but can’t get on board with this one. All of your same arguments can be made for term life except the tax advantages accounts one. And honestly I’d argue that’s a case of letting the tax tail wag the investment dog. At some point in your life the loss of a spouses cost in financial terms will be the price of burial. (Obviously emotionally more but life insurance won’t fix that). Ie there will come a point when they don’t provide income or watch the kids( equally important). At that point what exactly are you insuring? Instead your locking funds up in an illiquid account. No, you can’t replicate this with term life. I have not seen any policies with a term of 40 or 50 years. You can’t borrow against the term policy and you won’t get dividends either. The thing you could do is to do a 20 year term and then apply again for a new 20 year policy. But the cost could be astronomical then. For WL, the cost of insurance will go up after a number of years. The death benefit will not keep up with inflation. For term life and invest the rest, after a while the “invest the rest part” will exceed the death benefit, and will likely keep up with inflation better. And it is completely liquid. The cost of insurance is level (at least with our policies). And it’s to be paid only for a set number of years (e.g. 12). The guaranteed death benefit will indeed stay constant in nominal dollars but with dividends it will grow and has the potential to stay ahead of inflation! We do think a lot alike, Big ERN! While I don’t have WLI, I did buy a 20-year term policy to help “bridge” my wife in the event of my demise before Age 72. We’ll be setting my pension up as a “2/3 Survivor”, so my wife will be a 33% drop in the pension when I die. If I die after 72, our assets should suffice to cover her reduced spending. If I die before 72, the term policy will help bridge the gap. Excellent point! We will likely go with the 75 or 50% option for the survivor benefits of my (small) pension. It’s so small that it’s not worth it to “insure” but for folks with a bigger pension it’s a plus to have WLI! Thanks for stopping by, Fritz. Congrats again on your Plutus Award!!! My take on this is very different from anyone here. I ended up getting a term and whole life policy for each kid. The whole life has a cash-out policy. The beauty of it is that the premiums are quite low since the kids are young. After 20 years, the whole life policy’s premiums don’t have to be paid anymore and they keep accruing cash. The term policies are just that. Short term and very cheap and renewable once the term is up. I don’t regret getting these policies for the kids. They can cash whole life out if needed and keep the other. Or keep both. Or let the term lapse. It gives me peace of mind on different levels. I wish my parents would’ve thought of this for us kids! Every product, including financial products, is created to fill a need in the marketplace. The challenge for consumers is that once a product exists it is to the producer’s advantage to sell that product to as many people as possible — regardless of appropriateness (college educations as guarantees of the good life….pickup trucks as fashion statements….life insurance as an investment, etc.). To continue with the vehicle metaphor: never blend the car purchase with the trade-in value negotiation, else you’ll never be sure what you paid for either. Great post! Do you have a spreadsheet template that you could share with your calculations? I’d love to play with it. Also, I’d be interested to hear any recommendations you have of companies that sell “good” WLI. I have seen proposals from New York Life and Northwestern Mutual. Very comparable ex ante IRRs. In the end we went with NY Life. No affiliate or other relationship. Hi Karsten! Cool blog, BTW! I noticed that nobody ever talked about unit-linked WLI. You probably hear about ULIP. I know some ULIP companies does not allow to open policies to US residents (at least for my insurance company it is true; and while I’m from Europe it is allowed). That’s probably the reason for the almost no discussions on that topic. Have you ever considered writing about ULIP? I would be grateful to know your thoughts about it. We don’t have collision coverage or WLI. I have term life and umbrella insurance. Good point about equity and bond. If you compare WLI to bond, then it’s not too bad. I’ll have to take another look at WLI. Another good point about long-term care, but why not just get long-term care insurance? That seems like a better option if there is a family history. Nice! Maybe for our next car we’ll self-insure, too! Glad to see that people with enough money in the bank do the “right thing” ! Great post. I had written off WLI, and although we don’t have term insurance either, I was wondering about what ages you recommend purchasing WLI. You mention that it is very expensive to buy term at age 55, for instance. Being 59, and my husband 62, I’m guessing WLI would be a pricey purchase at this point if our goal is to have it as an alternative to long term care insurance. It was a pleasure to meet you at FinCon. You are a treasure to the financial community. Thanks! I think past a certain age it becomes prohibitively expensive to buy either term or WLI. But for folks in their late or even early 30s it’s still affordable to buy WLI at reasonable rates. I am certainly not going to say WLI is a good idea, because 99% of the time it is not and what I am going to talk about is probably not a strategy nor reason to pick up WLI today. What I am going to talk about is what can be done with an old policy from the 1970’s or 1980’s that you still have and wonder if you should cash it in. I am going to show how all the gains can be used tax-free to fund a modest LTC (long term care) policy. All you need to do is have your agent set up an annual 1035 payment from your WLI dividend account to pay for your LTC. History – I had a $15k 65 Life WL policy from the mid 1970’s. It cost me something like $10,000 total cost over 30 years (roughly $25 month). By the way since I am now over 65 the WL policy is completely paid up. Somewhere around age 50 I noticed my cash value was increasing at over $2000 a year so I decided I could easily start paying the premiums (about $265 a year) from these proceeds and the cash value would still grow which it did. In fact around 2007 the cash value had grown to over $47,000, when I then added a modest LTC policy. Today some 44 years after taking out that WL policy I still have $77,000 death benefit (with $54k in cash value) and $155,000 LTC policy such that if I needed them both my benefit would be roughly $230,000 for a $10,000 investment. Just in rough numbers I think that is about an 11% return ($227 for 44 years to change $0 to $230k) on my money at this point in time. Once again not saying you will be able to do this today where interest rates are much lower than they were in the 70’s and 80’s, nor would you want to. But if you have a 35 year old policy with a sizable built up cash value it may be something you might want to investigate if you are in the 50-60 year old age range and wondering how to fund a modest LTC policy for zero cost or spend a little and get a larger policy. Interesting idea. Your calculation is correct: the IRR of that is 11%. Pretty phenominal! But maybe not replicable with a policy starting today! But still congrats on the wise investment move you made! Is there a wrong/good time to consider WLI? I know there are factors such as being married or having kids ect.. but lets say a 30 year old is close to reaching fi? Would that be too early? You say you may be close to financial independence at age 30. I am not really sure what that means to you, nor how you know you will still be financially well off 30 to 50 years from now. Putting the above aside for now, Life insurance of any type is not really something you need if you have more money than you can every spend. Insurance is a product you normally buy to protect against a loss. If you are married and or have kids then if you were to die you “may” need something to pick up what was lost in the “financial family” that you may have been supporting. You do not do this with WLI, you do it with a product that is designed for the specific term that you need it for and that is TERM insurance. In most cases there is no good time to consider WLI. It is certainly not a good investment and it is a very expensive form of insurance, unless you have a very unique need for it, such as a trust for a special needs child. Otherwise more normal investments will serve you much better, and 40 years down the road when you have different needs you can use the money however you want. That is one of the craziest ideas I’ve heard of for justifying WLI — did you make that up or hear it from a Sales Person? No offense meant but just wondering. How about re-reading your “10 commandments” and thinking about what they really mean. In the present day tax structure a “Taxable account is a tax-advantaged account,” especially if you manage it properly. If you have maxed out that account just let me know as I don’t know anyone who has done that, simply because you can’t! Then you turn right around and through inference compare bonds to equity returns and then say since WLI returns are better than bonds you should “invest” in WLI as a bond allocation. In the first place let me turn right around and say again WLI is NOT an investment vehicle!!!! It is an estate planning tool – something to use if you want to absolutely pass on a block of your savings to a beneficiary, or protect a spouse against an expensive end of life event concerning you. It is an expensive insurance product whose IRR is backed by bonds by the insurance company, but it will obviously NOT outperform bonds in the long run or the insurance company would go broke because that is where they are investing your money – IN BONDS, and they have a whole lot of expenses to pay along the way, so don’t think for a minute this is a good idea. Let’s also forget about the notion that those that cancel their policies are helping your IRR. Another crazy idea not backed in a single shred of proof. 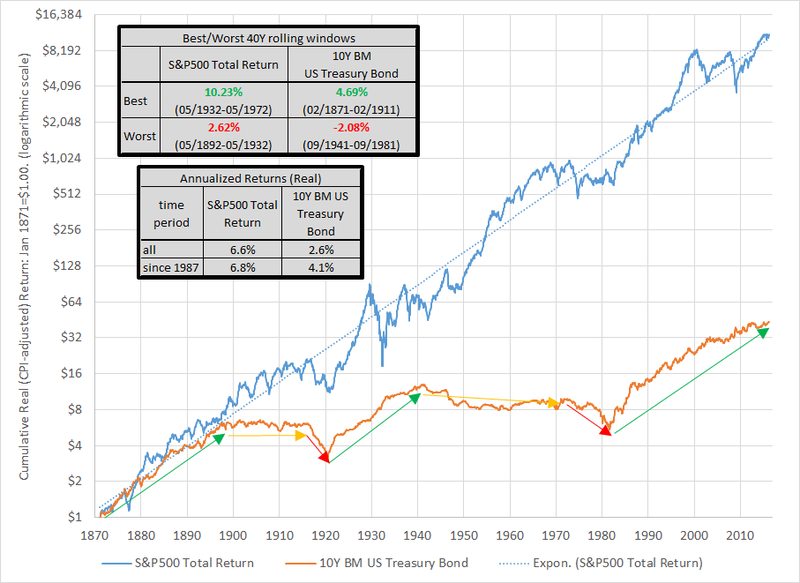 In the second place if you really study investment returns over long periods of time you will see that there are plenty of periods when bonds outperform equity returns. In retirement, bonds also help with the sequence of return risk and actually IMPROVE your total return during some of those down years and can keep you from actually running out of money. Finally, in the area of taxes, I don’t see where you mention that if you withdraw money from policies cash value, it of course reduces the policies value – no big surprise there I hope – this is not “free” money, but more importantly it is fully taxable at your ordinary income rate on everything above the amount of after-tax money you have put into it – WORSE than what would happen with the taxable account I was suggesting you need to “maximize” first! First (and only IMHO) rule of buying WLI is to understand it is an insurance product not an investment product. If you make some use of the cash value in the future because you decide you need less insurance then that is fine, but don’t fall for the fallacy that this is some kind of great investment that only the rich know about. It is not. If you like math, how about running an analysis on putting $10,000 a year into I-bonds for 40 years, as opposed to putting $10,000 a year into a WL policy for 40 years and see which one wins as being a better investment vehicle. The only slight advantage to the WLI is that you get to separate the principle from the earnings and draw your principle out first, but you can certainly withdraw the I-bonds out in a reverse order to when you bought them and mitigate most of that risk. Once you get to the earnings in the WLI you are back to 100% ordinary income. In the present day tax structure a “Taxable account is a tax-advantaged account,” especially if you manage it properly. True if you hold only equities in the account but not bonds. But there is no way you can hold bonds in a taxable account and do that in a tax-efficient way. And if you hold bonds in a tax-advantaged account, there is the issue of crowding out your equities, see the diagram in my post. Again, have you even read the post? Insurance, investment and estate planning are all intertwined. One doesn’t rule out the other. I like to leave a bequest and whether that’s our final portfolio with a bond portion or an all-equity portfolio plus WLI death benefit doesn’t matter one bit! Once you get to the earnings in the WLI you are back to 100% ordinary income. I never intend to take out the earnings of WLI. It’s part of the bequest I plan to leave. I wouldn’t do it too early, i.e., before you have a sizable nest egg, but also not too late when you’re too old and the premium is too expensive. I got mine at age 37, my wife got hers in age 31. I appreciate you fessing up to having a WL policy. 😀 Thanks for laying out your thoughts and Commandments. Of course I’ve heard the “Buy Term and Invest the Difference” and most likely that is appropriate for many people. I’m doing plenty of that myself in fact! There is NO way I could ever cover my insurance needs with Whole Life. However, I personally have a small WL policy that I plan to grow (through paid up additions) and utilize it to cover a pretty significant pension down the road. Talking to my (older) fellow employees a few are getting ready to retire and are exploring getting a Term policy to allow them to take more of their pension (no survivor benefit so 100%) and if they meet their demise, the life insurance will cover the surviving spouse’s needs. They are effectively replacing what the spouse would have gotten as a survivor’s benefit (50-75%) with a life insurance payout. Of course it is pretty expensive as a 60 years old! But in lots of cases it actually makes sense, as expensive as term is at that age. But like most things…It Depends! Also, your point about False Dilemma Fallacy is appreciated. Rarely are things black and white and all or nothing. And I appreciate you calling attention to the behavior economics influence that we all tend to have throughout your posts. Attempting to think straight is a first step to many things in life, especially when it comes to money. Easier said than done! Thanks! Great point: term life will become very expensive past a certain age. So, it might be useful to have the (small!) insurance need already covered when you get there. And WLI might be one affordable option for permanent coverage. Would it be interesting or relevant to your blog to know some of the nuts and bolts of putting together an accumulation-focused policy? Like dividend options to use, variable vs portfolio-based, ratio of blended term to base whole life and additional premium? I know there is a big NAIC product change-up in the industry this year based on reserve ratio changes, but the principles should hold. Not sure if you want to go any deeper, but considering probably 30% of my day is spent structuring accumulation-oriented policies for HNW clients who want a safer dollar but find bonds in taxable distasteful, I thought I could be a resource if you wanted to know more or do another WLI post.